There are 45 city salt spreaders, some still full of road salt left over from the winter, parked bumper-to-bumper on Lake Shore Drive, just to the east of "Selection Square". 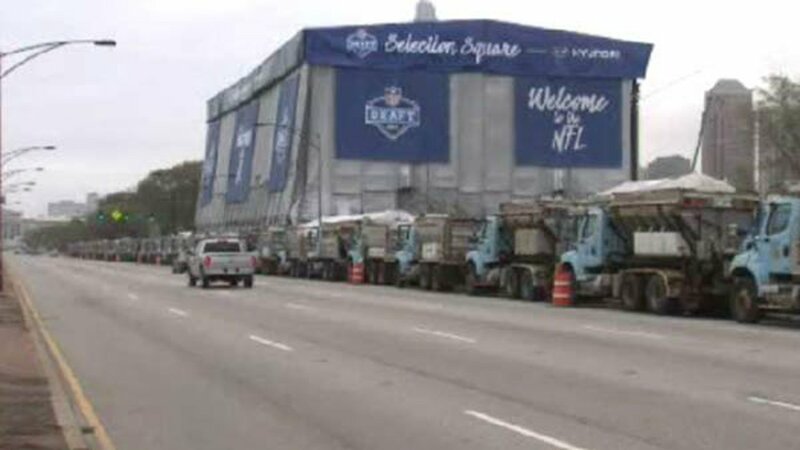 CHICAGO (WLS) -- A steel curtain of Chicago Streets and Sanitation trucks has been put in place to block the NFL main stage from vehicle bombers and other potential intruders this weekend. There are 45 city salt spreaders, some still full of road salt left over from the winter, parked bumper-to-bumper on Lake Shore Drive just to the east of the "Selection Square" pavilion that will be used for Saturday's player draft festivities. "This is for security," Streets and Sanitation spokesperson Jennifer Martinez told the ABC7 I-Team. It is a solid front line that apparently became necessary when some of the NFL Draft proceedings were moved from the Auditorium to a temporary hangar-like facility near Buckingham Fountain. "The expanded footprint of the Draft this year has resulted in some changes of the set up both within the event itself and the security associated with the event," said Melissa Stratton, spokesperson for the city's Office of Emergency Management and Communication. "The trucks (approximately 45) along Lake Shore Drive are in place to secure the outer perimeter of the event behind Selection Square." For motorists and those attending draft events in Grant Park, seeing 20-percent of the city's snow-fighting fleet parallel-parked across from Lake Michigan is an unusual sight. The 15-ton, sky-blue and gray trucks are normally on the move in snowstorms with plows affixed to the front, clearing streets and spreading salt. But police and security officials have determined that the trucks are also solid defensive weapons against possible gatecrashers to the biggest off-season event in the NFL. The Selection Square pavilion that is being protected by a cordon of trucks is part of the NFL's Draft Town, a free three-day, interactive, outdoor festival aimed at bringing in fans and tourist dollars. Even though Chicago - as host city for the second straight year - expects a $100 million economic infusion from the draft, officials say that the costs associated with those Streets and San trucks are not being covered by taxpayers. "Any costs associated with the Draft will be paid by Choose Chicago," Stratton said. "No taxpayer money is being used on the Draft." Choose Chicago is the city's official tourism bureau. Its $30 million annual budget is funded partially by private donations but a sizable portion of the agency's funds are from city and state tax dollars.